Talking of anticipation — It’s always wonderful to meet in person people whose texts you have read for years — and admired. Richard Grusin’s visit at Anglia Ruskin finally took place, and was as every bit interesting as I was expecting it to be. His and Jay David Bolter’s Remediation-book and thesis had a huge impact in combining my new media interests with my background and training in history, and now his new stuff on premediation promises to combine such theoretisations of temporality with the very current debates concerning affect, security and media culture. 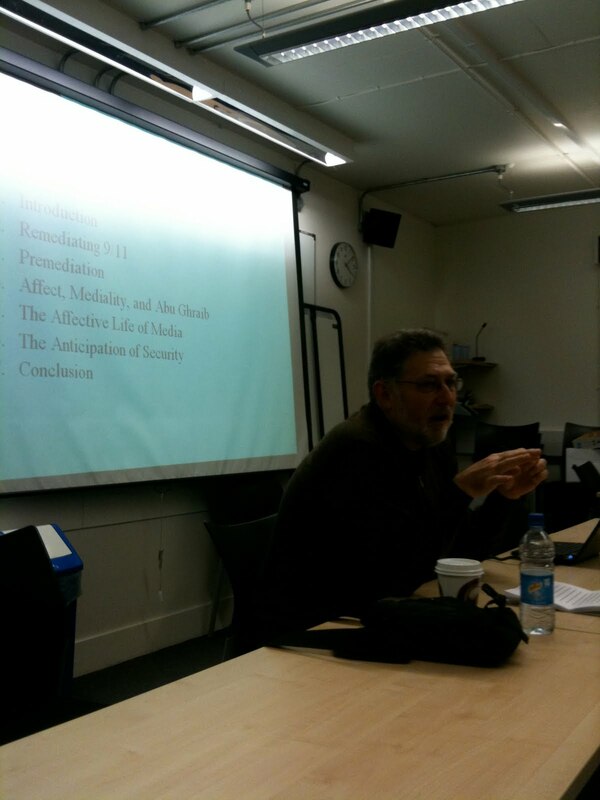 Grusin’s talk was very much contextualised in his soon forthcoming book Premediation: Affect and Mediation after 9/11 (Palgrave). The book promises to be a mapping of the non-representational and non-cognitive forces of the securetized social media culture where affects (in the sense of also positive “good vibes” as well) and security are complementary states or atmospheres of bodies in relation. This includes not also human bodies (“having feelings”) but relations between humans, nonhumans and in general heterogeneous assemblages. This is the regime of affective flows between such objects/subjects. The richness of the talk is hard to convey through any summaries so my notes remain fragmented. The easiest would be to say: read the book! For me, certain key points stood out. The point about our media culture based on the atmospheric affect of “anticipation” instead of e.g. distraction (Benjamin and Kracauer) is certainly one such; and applies in Grusin’s reading both to bodies in social media culture of expected, anticipated, potential social interaction through software-mediated platforms as well as to the inbuilt modes of anticipation in software. This “mediaphilia of anticipation” is a nice way to frame the software promoted anticipatory gestures that often are approached through medicalised conditions (ADD etc), but are in fact generalised modes of subjectification. Grusin’s critique of Agamben and notions of “state of exception” were important as well, and resonate with recent Hardt and Negri points in Commonwealth. Instead of approaching contemporary constellations of power through such notions that hint of transcendent powers and sovereignty (state of exception and being able to rule such), immanent ways of how power operates take into account the much more “business-as-usual” type of handling events, establishing patterns, managing repetitions, actions and relations in everyday life. That’s software culture. Affect is a way for Grusin (as for many others) a way to approach the non-cognitive and non-representational ways how media do not (just) signify but do things to us and with us. I think Grusin could have elaborated a bit more on this more virtual and somatic sphere of the affect when talking about gesturality in media culture — and how it is as I have used the word more “atmospheric” preparadness as a potentiality of the body as a tension, attention, than just actual gestures (which are important and through which the atmosphere of virtuality of such anticipation gets articulated). In any case, his critique of some nostalgic accounts of online activities that lie on politics of authenticity were to me spot on) as was Grusin’s discussion of the necessary preformatted modes of living; the patterns of repetition that are necessary for everyday realities. Any kind of resistance has to work immanently within such formations, not neglecting the reality of for example us needing habits. This opens a completely different political horizon. In terms of how this position relies on rethinking some of the temporal ties — and temporality as a crucial feature of the affect-embedded security regimes — premediation-thesis comes close to for example Greg Elmer’s and Andy Opel’s notions concerning pre-emptive measures of control. Security measures happen pre-emptively, shooting before asking questions, making sure that the state of things is always such that any potential events that are undesirable do not take place. No wonder that Minority Report is here the key film for such social theory. I know that discussing such positions in relation to for example Erin Manning’s “preacceleration” would be fruitful as well (thanks to Andrew Murphie for flagging this potential connection), but I have to admit I have not anything that special to say (and that Manning’s book is at the office shelf at the moment). Her way of discussing movement and dance and bodies-in-movement through preacceleration refers to the primacy of the forthcoming-transformation that the body attunes to continuously. For Manning, bodies are not present but moving, prehending and in this sense ahead of their time a bit paradoxically — a realisation that comes through clearest in dance. Bodies catch wind, and move as part of such attractors that dance is filled with (whether “stable” objects, or dance partners). The anticipatory nature of such preaccelerated bodies is something that ties in with Grusin’s points that I would have to read more about as the mechanisms of anticipation as a way of orienting towards certain intensities and attractors (e.g. again social media culture features as banal as the commenting function and its potentiality to attract comments) is one way of thinking “bodies in speed” (Mackenzie). >thanks for this Jussi … some clunky comments .. it sounds like "premediation" works the ongoing tension between preacceleration and preterritorialisation, if I can put it that way … finally we're getting a new critical language to discuss societies of control more precisely … as well as the gaps within them .. or that they themselves produce perhaps.